Are you so in love with the supercar-slaying Nissan Juke R? Well then... prepare to be let down, because Nissan did not tell us they're building more of them at the Chicago Auto Show. 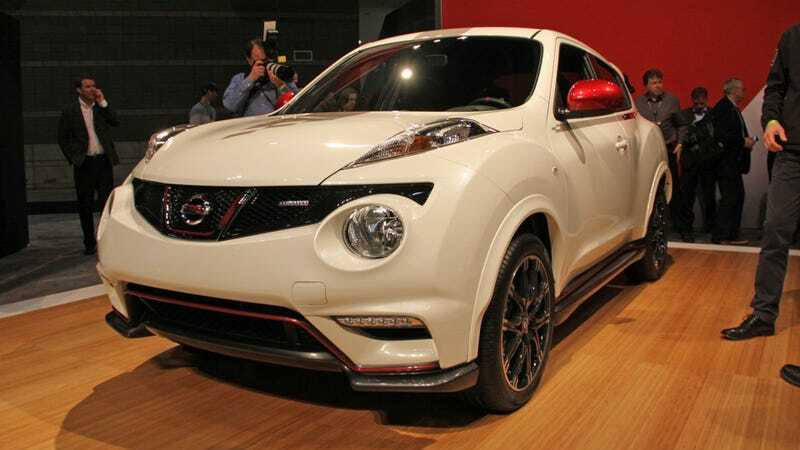 Instead, they're bringing us the NISMO Juke. It may not have the Lamborghini-destroying horsepower of the R, but it's certainly cooler than a normal Juke. And we're all thankful for that. Special features on the NISMO Juke include a revised aerodynamics package, a strip of LED lamps on the front fascia, red pinstripes and trim, smoked-out headlamps, a new grille and a different spoiler. Basically, you can now own a Juke that is both racy-looking AND somewhat visually offensive, although I do say it looks better than the base model. Power is bumped slightly from 188 horsepower to 197 horsepower using the same 1.6-liter turbo four as the base Juke. The NISMO model comes in either front- or all-wheel-drive, but if you want power going to all four wheels, you'll have to live with the CVT instead of a manual transmission. Thanks, Nissan, for not giving us all the Juke we really wanted: a more powerful AWD version with a stick.